You are six today. Six! That’s one-third of the way to 18. You’ve grown so much this year. Taller. Wiser. Kinder. More confident, and though I didn’t think it was possible, more curious. Aggressively curious, even. And infectiously thrilled by every new thing that you learn. On Mother’s Day, you explained how the Himalayas were formed to three separate audiences, how they are folded and getting taller every year. No wonder I got so excited when I found a DNA stencil at the craft store yesterday. We’ve traded in bedtime storybooks for brief tomes about Silicon, Chlorine, Fluorine & Iodine, and Sulfur. Then you always manage to extract sciencey, psychedelic stories from my imagination in which you are the star (sometimes of the plasma variety) before you fall asleep. Thankfully, you return to storybooks now and then when I grow weary of molecules. When there are pictures or short chapters, you do most of the bedtime reading. Earlier in the school year, you started asking me six times four, three times seven, nine times ten from the back seat of the car, using your fingers like the Montessori chains. “I’m not sure if it’s safe for mommy to do math and drive,” I told you. You kept testing my multiplication skills anyway. I am always a little stunned, although I shouldn’t be at this point, at the things you understand – like the kind of math you have to do in order to find that number. And then I’m a little sad, because I also understand why the length of a life might be of such interest to you. You watched your Grandfafa fade away last summer, and bravely read a book at his funeral. The last year has taken us to a plethora of hospitals and funeral homes. You know I spend every Saturday morning with someone else who will be passing soon. You dive-bomb me with hugs and kisses the moment you sense any sadness. Sometimes, I am overcome with worry around 4 a.m., feeling this is all much too much for you – deaths, illnesses, separated parents – all this while you’re figuring out how to keep your feet clean in the muddy world of playground politics. But we’re good about talking right now, you and me. We share and work through things. We feel sad when we need to. We rebound. It feels like most of what we do when we are together is laugh. I try to remember to stop and breathe you in the way I did when you were a baby, to breathe in these fleeting moments when I can still carry you, still snuggle you so that you can feel little and safe. The real reason I imagine that you want to know how many days are possible in a lifetime is because you are busy calculating how to make each one count. And you do. You really do. More than anyone I have ever met. 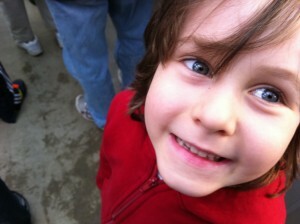 Declan, I love you so spectacularly much that my heart can hardly stand it. Thank you Stacey. And it was a blessing for us to meet you!